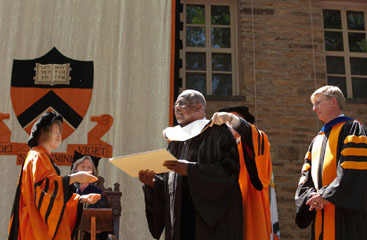 HOME RUN KING HONORED AT PRINCETON COMMENCEMENT: Baseball legend Henry Hank Aaron (center) receives his academic hood from Chief Marshal Douglas Clark after his introduction as an honorary degree recipient at Princetons Commencement ceremony. Looking on (from left) are faculty marshal Angela Creager, Princeton President Shirley M. Tilghman, and columnist and University Trustee George Will. Princeton Universitys 264th Commencement Exercises concluded on Tuesday with the awarding of degrees to 1,202 undergraduate members of the Class of 2011, and 815 graduate students. University President Shirley M. Tilghman was among the speakers who encouraged members of the Class of 2011 to make a commitment to public service. In a 9-1 vote at a meeting Wednesday, May 25, the Princeton Consolidation and Shared Services Commission voted to recommend that Princeton Borough and Princeton Township be consolidated into a single entity that would be known as Princeton. A borough form of government with an elected mayor and six at-large council members holding staggered terms would be put in place, should voters approve consolidation in November. The receipt of a $25,000 check from the Princeton Education Foundation (PEF) and a presentation about his first year on the job by John Witherspoon Middle School (JW) Principal Jason Burr were highlights of last weeks Board of Education meeting. The Board, in turn, expressed their appreciation to the PEF, and to Mr. Burr. Sustainable Princetons BYOBag campaign will have its official kick-off on Thursday, June 9, on Hinds Plaza, right outside the Princeton Public Library. Organizers are hoping that the movements motto, change a habit and change the world will encourage area residents to get into the habit of bringing their own cloth or recyclable bags with them when theyre out doing errands. A Princeton University alumnus who heads a privately held railway investment and management firm wants to buy the Dinky rail line. Henry Posner III, chairman and founding principal of Railroad Development Corporation (RDC), presented his proposal to Princeton Borough Council at its meeting last week. After voters decide between Democratic candidates David Goldfarb and Yina Moore as the partys nominee for Borough mayor on Monday, June 6, the winner will run as the endorsed Democratic candidate in the November general election. After the Princeton High boys lacrosse team tied Robbinsville 8-8 in mid-April to move to 1-3-1, senior defenseman Robby Dowers and his co-captains decided it was time to clear the air.